New York Times columnist Bret Stephens (center) speaks at an event Monday. Stephens and his colleague Bari Weiss (left) spoke about challenging discourse and the importance of free speech. Reporters at The New York Times had a moment of post-election clarity on November 9, 2016: They realized they did not fully understand the country they were reporting on, opinion columnist Bret Stephens said Monday at Northwestern Hillel’s annual speaker event. The event, titled “The Virtue of Thinking Different,” was held in the McCormick Foundation Center Forum. 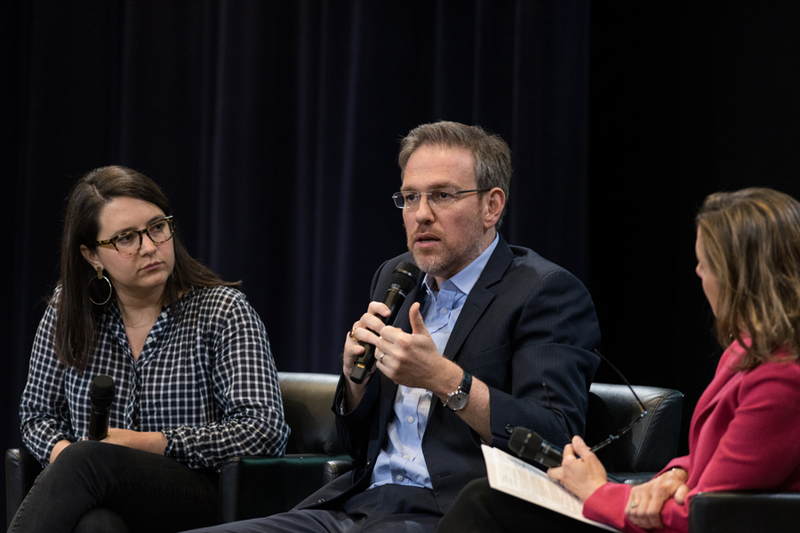 Stephens, accompanied by fellow Times colleague Bari Weiss, spoke about free speech and challenging discourse on a panel moderated by journalist Abigail Pogrebin. Stephens and Weiss both write columns for The Times, and their work has challenged writers from within their own political communities. Weiss spoke about how her columns often spark heated debates on social media. “I am not trying to violate taboo for the sake of violating taboo,” Weiss said. She added that she wants to bring “the conversation that people are having over their beer” to a wider platform. During the event, Pogrebin asked Stephens and Weiss about practicing free speech on college campuses. Stephens expressed his support for allowing controversial opinions at universities. He added that in a university setting, what should be questioned is the intellectual value of the speech; when institutions begin banning individuals, they move down a dangerous road, he said. Weiss emphasized that she does not believe speech can be “violent.” Though speech can be hurtful, she said it would be “absurd” to call it violent. Inviting dissenting opinions to campus and having the events garner low attendance can potentially discourage people who hold those opinions more effectively than outright banning those speakers from campus could, she said. Former Hillel president Samantha Max told The Daily she helped choose the speakers. The Medill senior said the organization had many different options, but felt strongly about bringing columnists to campus because of the current political climate. In the polarized political climate, Max said it can be easy for people to surround themselves with others who hold the same beliefs and forget to think critically.